The Verona Arena is a Roman amphitheatre in Italy. 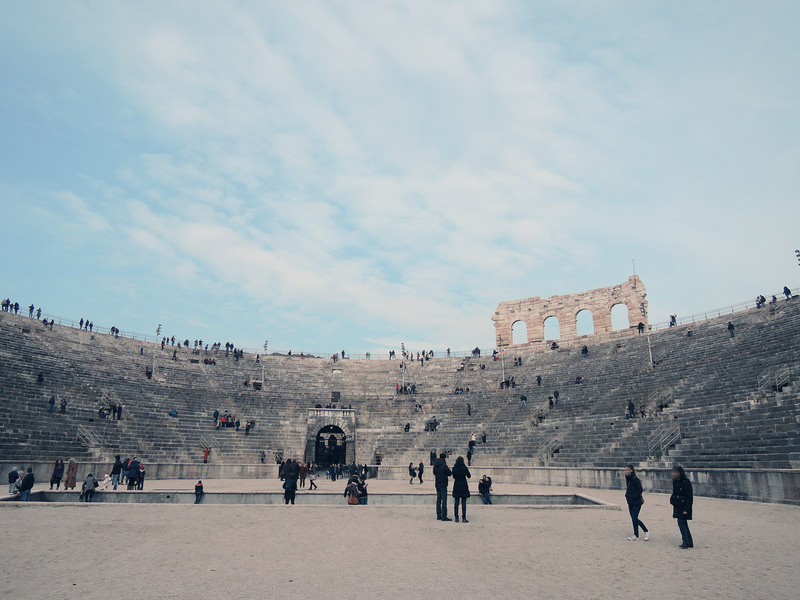 Through the centuries it has been used for shows, games, gladiators fights, tournaments and more recently for Opera. The Verona Arena dates back to the I century, built during Augustus’ Empire. Its central area is composed by sand (hence the name Arena, which in Latin means sand). All around there are 45 big stone steps “bleachers”, which can contain 30.000 viewers. After the Roman period, the Arena hoted games, tournaments and celebrations, but also trials and public executions. 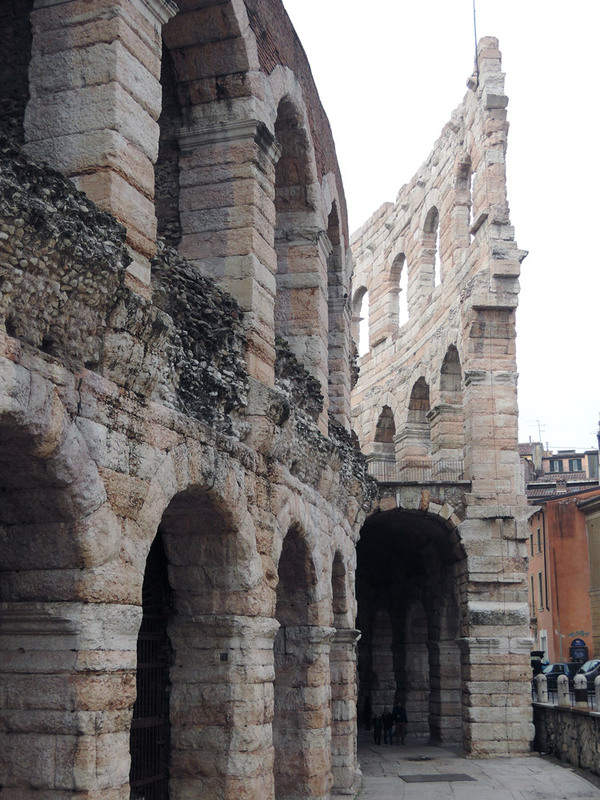 In 1183 an earthquake destroyed the external order of arches that surrounded the Arena. Today only a small part of it still stands. The interior perimeter of 72 arches is in perfect conditions. During the Middle Ages legal disputes were resolved here: each defendant could choose a trial by combat (yes, like in Game of Thrones) using professional wrestlers. Even Dante witnessed one of these trials and mentioned it in his Inferno. 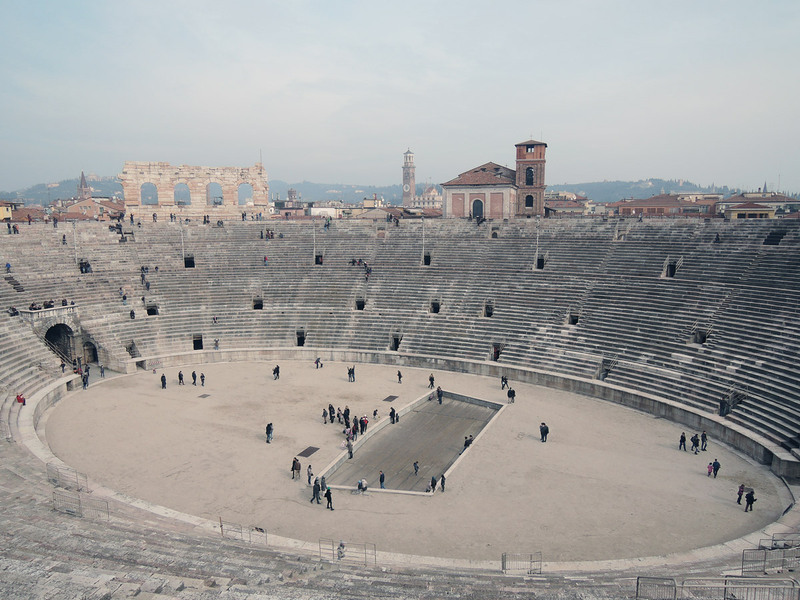 In the nineteenth century the Verona Arena hosted mostly equestrianisms, races, gymnastics, comedies and tombola games. In 1805 Napoleon assisted a bullfighting and in 1857 Emperor Franz Joseph participated to a tombola game. 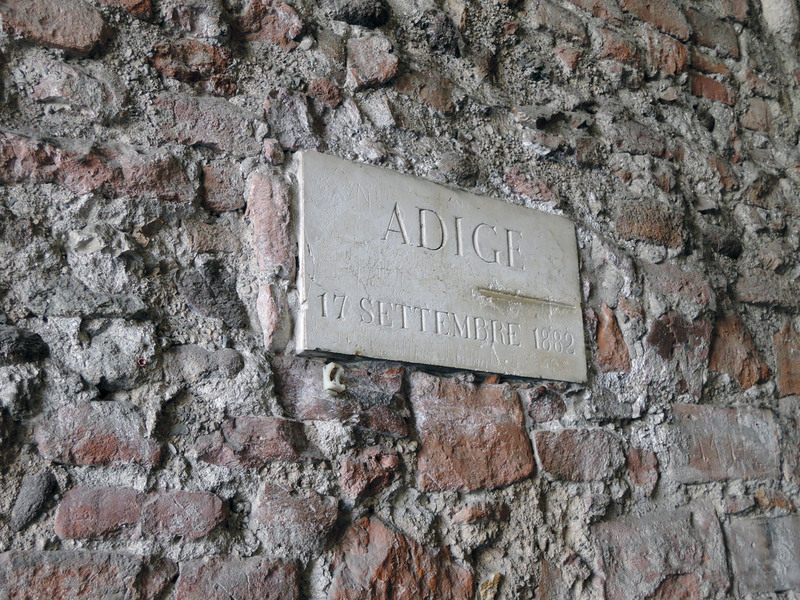 In 1882 a huge overflow of the river Adige caused many victims and significant damages to the city. You can still inside the Arena (close to the Ticket Office) a plaque indicating the water level. It is impressive because… well it is very high! During World War II some works to protect the arena from the bombings were made. At the end of the conflict the Superintendence started a whole series of works of improvement and restoration. I visited the Verona Arena the first Sunday of March so I only paid 1€. I’m glad I did that because the Arena is really bare. Majestic, but bare. You enter and you walk around, you can climb the stone steps, taking pictures and nothing more. Moreover there are no explanatory panels. I think the best thing is to come here with the Verona Card or to attend an Opera, if you like it. I like Opera very much. Me and my father came here to see Traviata, Il Barbiere di Siviglia and Othello. In addition to the fact that I love this opera, Othello was portrayed by Placido Domingo and I was so lucky to meet him! Ah, good memories! Pay attention to the representations (you can ask to the ticket office). I personally like traditional representations. I don’t like to see Violetta singing Amami, Alfredo wearing jeans! If I go to see Opera I want to see wide, romantic dresses, historical setting and so. Obviously this is just my personal opinion. The orchestra pit can accommodate 150 musicians. The choir has 200 singers. 100 dancers and 200 background actors work during the season. The first proper opera season began in 1913 with Verdi’s Aida (100 years after the birth of the legendary composer, which I love). Even Kafka, Boito, Mascagni and Puccini were there as viewers that day. Nowadays, over 500.000 people attend an opera performance in the Arena every year. 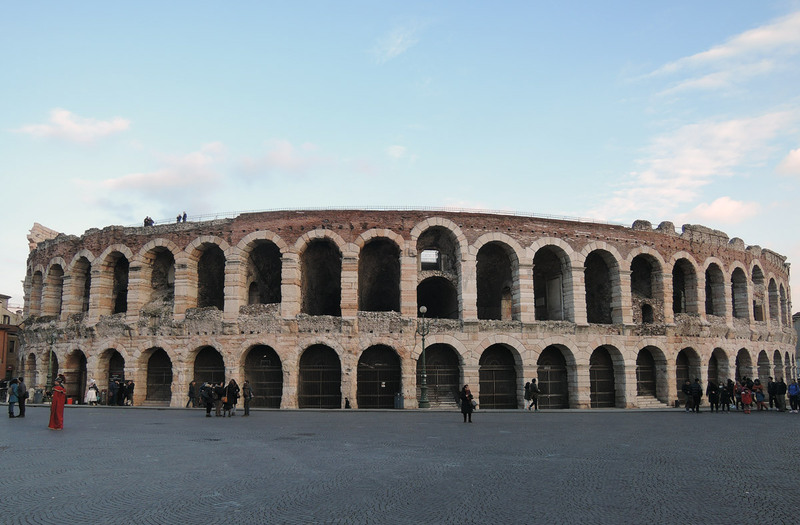 Hence, Opera is one of the most important source of tourism for Verona. Another post in this blog regards the Arena. If you’re interested in Opera, you can read my post about A Night at the Opera in the Verona Arena. During the Opera Season (summer) the interior of the Arena is not bare as I found it in March! You will find the stage for the shows and the plastic seats. So the atmosphere may be quite different. There are always last minute tickets you can buy the very day in which you’re in town. This is brilliant mainly because this way you can avoid disappointment (for example bad weather). Mon 1.30 – 7.30 p.m.
Tue – Sun 8.30 a.m.- 7.30 p.m.